A sensitive stomach and digestive tract may result in a large quantity of poor quality faeces which may also indicate poor digestion. Additionally, swallowing too quickly without sufficient chewing can lead to regurgitation. Digestive care is a precisely balanced nutritional formula which helps support digestive health. with double action. Easy to digest: the digestive care formula contains highly digestible proteins (l.i.p.*). it is based on a blend of prebiotics (fos: fructo oligo-saccharides) and fibres (including psyllium) to help support a balance in the intestinal flora and regulate intestinal transit. *l.i.p. : protein selected for its very high digestibility (more than 90%), for digestive health and stool quality. The complete wet food is also for adult cats one year and over, with sensitive digestion. It has been specially developed to be easily digested and gentle on your cat's stomach. The chunks in gravy provide your cat with an easy texture and consistency, ensuring easy chewing and digestibility. They are also very palatable to suit the fussiest of appetites. The food also has an adapted moderate calorie level to ensure that your cat maintains an ideal weight and body shape. A healthy urinary system is encouraged with a reduced concentration of minerals, as they can produce calculi. Royal Canin studies in 2010 showed that Digest Sensitive will help to significantly reduce feacal odour and is highly digestible. Proven results: -49% less faeces in 10 days: The exclusive use of digestive care is effective after 10 days: 49%* less stool production thanks to improved digestion and nutrient absorption. *royal canin internal study, 2014 - compared to a maintenance feed for adult cats. 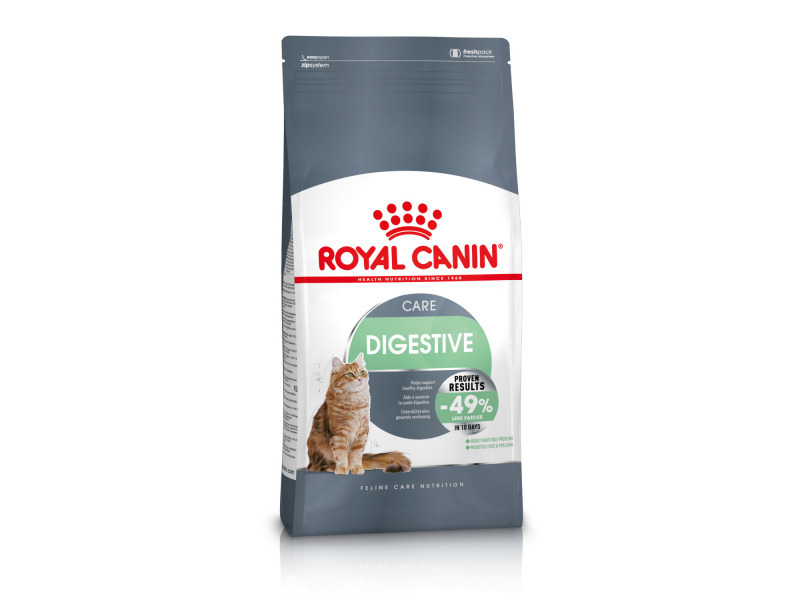 Promotes chewing and slower eating: the digestive care ringshaped kibble helps the cat eat more slowly and chew thoroughly for good digestion. Urinary Care: Formulated with a balance of minerals to help maintain the health of an adult cat’s urinary system. Vitamin A: 18000 IU, Vitamin D3: 900 IU, E1 (Iron): 42 mg, E2 (Iodine): 4.2 mg, E4 (Copper): 13 mg, E5 (Manganese): 54mg, E6 (Zinc): 114 mg - Technological additives: Clinoptilolite of sedimentary origin: 10 g - Preservatives - Antioxidants. Complete feed for adult cats with digestive sensitivity (chunks in gravy). Vitamin D3: 140 IU, E1 (Iron): 2 mg, E2 (Iodine): 0.15 mg, E4 (Copper): 1.1 mg, E5 (Manganese): 0.6 mg, E6 (Zinc): 6.5 mg. 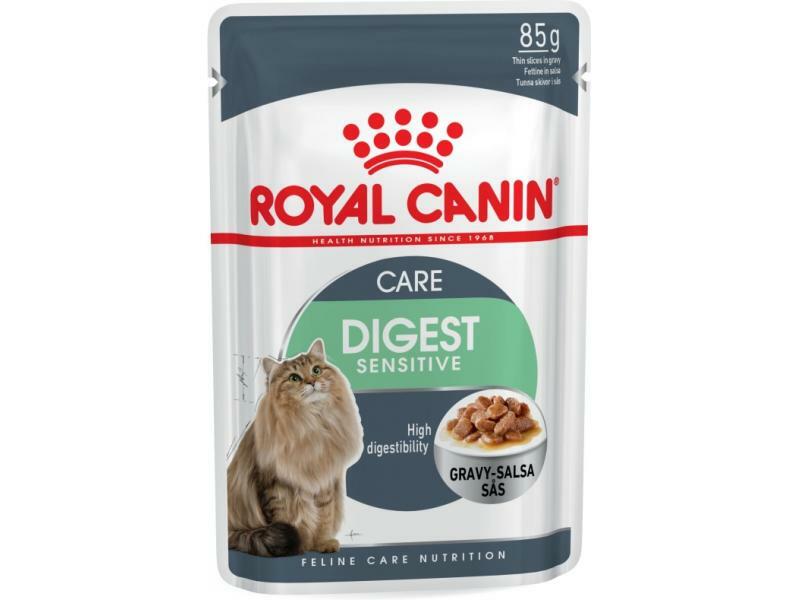 There are currently no questions for Royal Canin Feline Care Nutrition Digestive Care Cat Food - be the first to ask one!